Typically, a brokerage account probably contains more than one type of security. Therefore, a brokerage account uses a list of securities — and you, as the investor, need to create and maintain the list of securities in Quicken 2012 (stocks, bonds, and so on) that your account holds. 1Choose the Security List command. 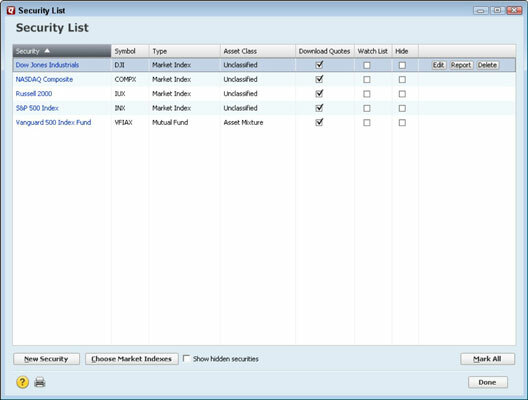 Display the Investing tab, click the Tools button, and choose the Security List command. Quicken displays the Security List window. Note that any mutual funds you’ve already set up appear in the list as securities. 2Click the New Security button in the Security List window. 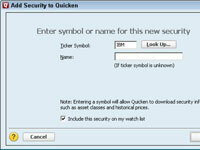 Quicken displays the first Add Security To Quicken dialog box. 3Enter the stock symbol for the security in the Ticker Symbol text box. If you don’t know the symbol, make sure that you have the name of the security correct and then click the Look Up button to search for the ticker symbol at Quicken.com. 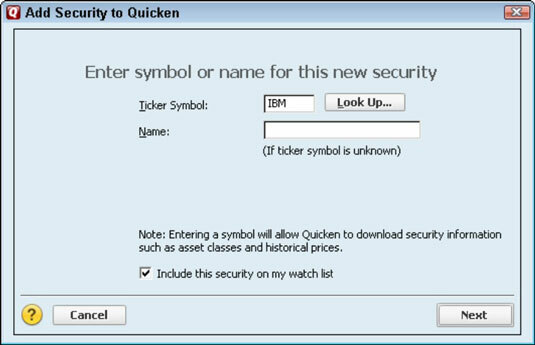 Quicken retrieves information about the stock whose ticker symbol you entered and displays it in another Add Security To Quicken dialog box. Quicken adds the security to the security list and redisplays the Security List window. If you have additional securities, you can add them by repeating Steps 2–4. Also, you can add securities on the fly while you’re recording the purchase of a security for the first time. When you do this, Quicken starts this little Oh, let’s add another security to the list process for you at Step 3.